Whereas yesterday’s picture encompassed a range of, say, about 50mm, I guess this shot covers a range about a million times wider (that is, 50km). 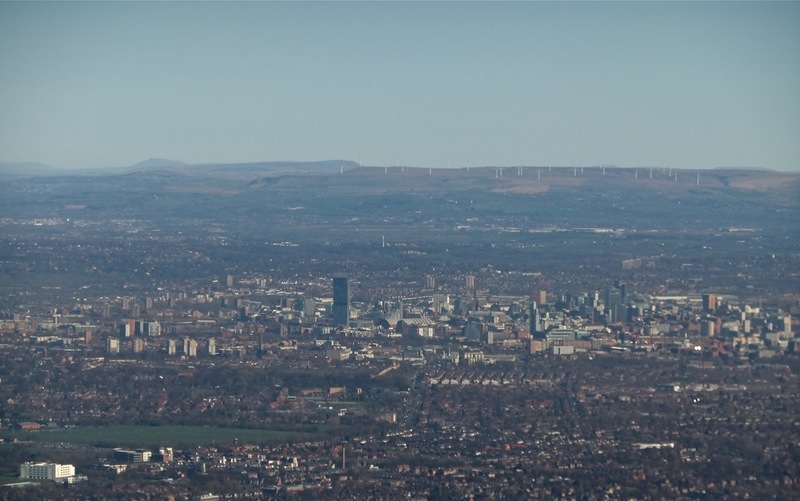 This is the view I got this morning as my plane took off from Manchester airport to the south of the city. The prominent building just left of centre is the Deansgate tower (a Hilton hotel on its lower floors, residential apartments above). The main city centre is to the right. The university will be on the edge of where the high buildings start, just to right of centre. As you can see it was another beautiful day in the North-west of England, 20°C at least – but not in London, where I was flying on this leg (clamped under a foul brown smog when we landed); nor, indeed, in Moscow where I currently reside (-1°C, a few inches of snow, and still thoroughgoingly winter). Ah, what the hell. It’s all the travel experience, innit.